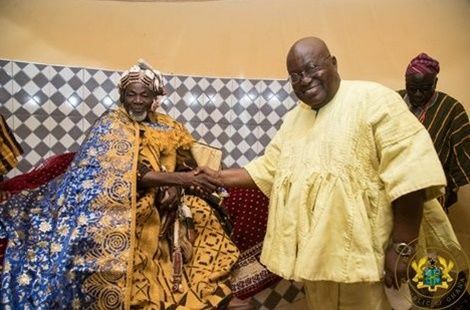 The President of the Association of ‘Kayayeis' in Ghana, Hajia Adiza popularly known as ‘Zongo Pioneer’ says President Nana Addo Dankwa Akufo-Addo must be highly commended for ensuring the restoration of peace to Dagbon after so many years of conflict. On November 2018, the committee of eminent chiefs led by the Asantehene and the two feuding gates presented a peace road map to the President at the Jubilee House with both the Abudus and Andanis promising to abide by it. The roadmap saw the performance of the funeral rites of the late two overlords of Dagbon, Yaa Naa Mahamadu Abdulai IV and Ya Naa Yakubu Andani II and the subsequent enskinment of a new Ya Naa for the Dagbon Kingdom. Speaking to Peace FM News, Hajia Adiza noted that, President Nana Addo’s posture towards the reconciliation and peaceful resolution of the Dagbon chieftaincy feud is unprecedented and surpasses any by his predecessors was “remarkable”. “President Nana Addo has done so well. We also thank the overlord of the Ashanti Kingdom. Otumfuo Osei Tutu II for his leadership to the peace we have now in Dagbon,” she said.